A sushi rolls recipe can be so broad in selection as there are so MANY ways to fill them! But if you master the sushi rice the fillings are really just of preference. You don’t need to be a chef or have fancy fillings to make sushi rolls from home. The rice is the most important centerpiece in sushi making. If you get that right the toppings work like a garnish, in a way. When I’m not making spicy tuna rolls I will most likely have cream cheese as the basis in my rolls. Cream cheese definitely gives great flavor and texture to the crunchy veggies. This is my go-to procedure of sushi making and I’ve discovered a great substitute that works for the rice vinegar (these sushi rolls are made with it) along the way. 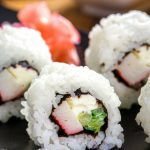 A simple and proven route to making sushi because I have been making this recipe for a while! Choose your toppings, garnish your rolls with avocado and dunk them in this must try spicy mayo sauce for an ultimate restaurant style sushi roll! Our families staple recipe! 1. Spread a heaping handful of sushi rice over the seaweed, dipping finger tips in water for easy handling. Flip sheet over and top with a few strips of cucumbers, cream cheese and crab sticks towards the lower end. 2. Roll sushi going over the fillings with the bamboo mat. Secure tightly before releasing and continue rolling sushi. 3. Slice each roll into 8 equal pieces and transfer to a serving plate. Drizzle with desired sauces and serve. Using a sharp serrated knife and dipping knife in water helps with slicing the rolls. If using too much water for handling rice, rice may fall off and not stick properly so use LIGHTLY. I like to roll all the sushi rolls first then slice and place all rolls onto serving plates. Use wooden or plastic utensils or bowls if possible. If wanting to garnish rolls with sesame seeds, do so before flipping the sheet with rice over. A sushi rolls recipe can be so broad in selection as there are so MANY ways to fill them! But if you master the sushi rice the fillings are really just of preference. You don't need to be a chef or have fancy fillings to make sushi rolls from home. Spread a heaping handful of sushi rice over the seaweed, dipping finger tips in water for easy handling. Flip sheet over and top with a few strips of cucumbers, cream cheese and crab sticks towards the lower end. Roll sushi going over the fillings with the bamboo mat. Secure tightly before releasing and continue rolling sushi. Slice each roll into 8 equal pieces and transfer to a serving plate. Drizzle with desired sauces and serve. I tried some of the sushi with avocado and cream cheese, and just want to say I loved it. Great recipe! Thank you.